Endochondral ossification is a process where bone replaces cartilage. The various stages can be seen in these front and rear legs of a fetal rat. The upper front leg shows the early stages of the formation of primary centers of ossification. Cartilage models form in the approximate shape of the adult bone. The lower rear leg shows the later stages of bone development. 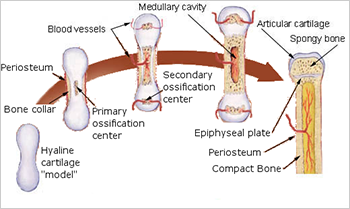 The femur shows the formation of the epiphyseal plates. The primary site of ossification can be seen in the diaphysis. The ephiphyseal plates (#1, #2) continuously provide for the lengthening of the bone.